Madison, Wisconsin. Three hour drive (straight shot and pretty) from where both Matt’s and my parents live. Less crime than Little Rock. Cultural comfort, from speech patterns to life pace. Snow, that white stuff I used to complain about that, somehow, we now miss. And a classical, Christian 3-days-a-week school that we could afford on that shiny new salary. All gone in one polite little email. I have mixed feelings about moving at this stage. 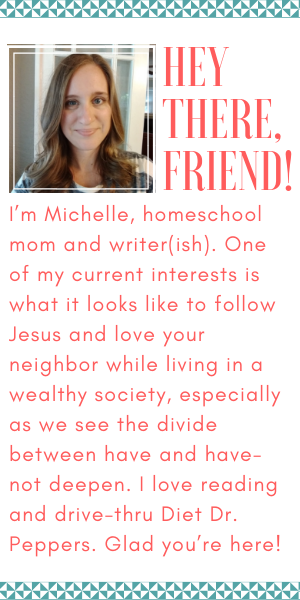 My kids love their homeschool co-op and all of their friends. We love our church and I’ve made some really great friendships. Moving would be a tremendous amount of work, from packing to starting over with people. But at the same time…moving would mean a fresh start. I could do everything the “right” way and finally get life “right.” The kids could go to school three days a week, and we’d be excited to see each other after–because distance makes the heart grow fonder, right? He is like a tree planted by streams of water that yields its fruit in its season, and its leaf does not wither. In all that he does, he prospers. It is not my job to make the fruit ripen. It is not my job to know what Matt’s “forever job” will be. It is not my job to know where our “forever home” will be. And it is not my job to worry about any of it. It’s my job to be planted by the living water, to be rooted in God’s Word. Worrying would be easier because it’s reflexive, soothing in its own ugly way. But worry is withering, and I want something better. God has brought us thus far, in spite of our flaws and (frequent) unfaithfulness to Him. We have three beautiful, healthy children; a church and church family that constantly point us back to Him; a healthy marriage; a homeschool co-op that keeps me honest. I will wait for the fruit because the water is more than sustaining.